The Van earthquake was a destructive magnitude 7.1 Mw earthquake that struck eastern Turkey near the city of Van on Sunday, 23 October 2011 at 13.41 local time. It occurred at a shallow depth of 20 kilometres (12 miles), causing heavy shaking across much of eastern Turkey and lighter tremors across neighboring parts of the South Caucasus and Levant. 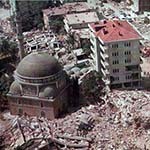 According to Disasters and Emergency Situations Directorate of Turkey AFAD on October 30, the earthquake killed 604 and injured are 4,152. At least 11,232 buildings sustained damage in the region, 6,017 of which were found to be uninhabitable. The uninhabitable homes left as much as 8,321 households with an average household population of around 7.6 homeless in the province; this could mean that at least around 60,000 people were left homeless. The other 5,215 have been damaged but are habitable.